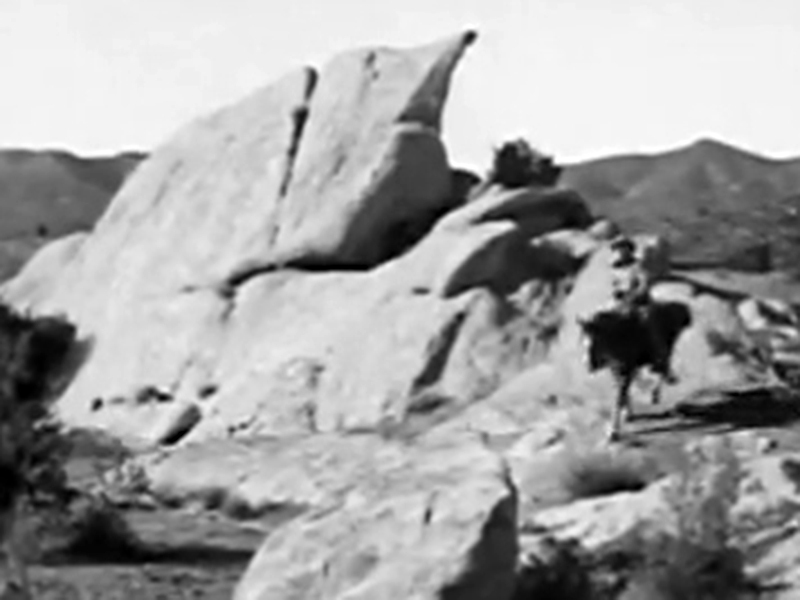 SCVHistory.com | Film-Arts | Film Clips: Jim Thorpe, Vasquez Rocks, in 'Rustlers of Red Dog' (1935). Above: Native American Olympic gold medalist Jim Thorpe (Sac and Fox/Potawatomi/European), known to sportsfans as "America's greatest athlete," plays the role of Chief Scarface in "Rustlers of Red Dog," a 4-hour, 12-chapter serial from Universal Pictures starring Johnny Mack Brown. Thorpe had minor roles like this one in numerous films shot in the Santa Clarita Valley when his athletic days were behind him. The sequences above reflect the entirety of Thorpe's on-screen time in this serial, just a couple of minutes. Thorpe's character is one of several "Indian chiefs" who are mounting a "general uprising" in a professed effort to stop new settlers from stealing their land and killing their buffalo. Thorpe's character finds an ally in the criminal gang leader Rocky (Harry Woods) and his henchman Snakey (Fred MacKay), who are also fighting the settlers, but for a different reason — they want to steal a $50,000 gold shipment. Above: It's difficult to tell where "Rustlers of Red Dog" is filmed, other than the scenes at Vasquez Rocks. Most of the scenery is nondescript canyons in the Santa Clarita Valley. (Not shown here, some scenes use the Alabama Hills, but it's probably stock footage.) A wide swath of the Vasquez Rocks area is used, including Texas Canyon. The clip above is a compilation of two protracted gunfights. The first 10½ minutes span the end of Chapter 8 and the beginning of Chapter 9. When gang leader Rocky escapes the clutches of hero Jack Wood (Johnny Mack Brown), from 9:00 to 10:30, the scene shifts to what appears to be Placerita Creek in the vicinity of the Oak of the Golden Dream, on what was then a section of the Walker Ranch. The remainder of the clip is the gunfight in Chapter 12. This clip shows at least the fifth and seventh times in this 12-chapter serial that Jack saves the damsel in distress, Mary Lee (Joyce Compton). Universal billed Brown and his sidekicks Laramie (Raymond Hatton) and Deacon (Walter Miller) as the "Three Musketeers of the Old West." Filming was completed in 1934; the serial premiered January 21, 1935. This was Johnny Mack Brown in his prime. In the mid-late 1940s, when Brown and Hatton were past their prime, they co-starred in a number of "buddy pictures" that were mostly filmed at the Monogram Ranch in Placerita Canyon. Miller had died in 1940. "Rustlers" is directed by Lew Landers. Writers are George H. Plympton, Basil Dickey, Ella O'Neill, Nate Gatzerta and Vin Moore	(screenplay) from a story by Nathaniel Eddy. Cinematographers are Richard Fryer and William A. Sickner. Rounding out the credited cast are William Desmond, Charles K. French, J.P. McGowan, Lafe McKee, Edmund Cobb, Chief Thundercloud, Chief Many Treaties, Artie Ortego, Bud Osborne, Jim Corey, Ann Darcy, Fritzi Brunette, Grace Cunard, Virginia Ainsworth and The Crockett Family (wagon train musicians in Chapter 4). Uncredited cast members are Silver Tip Baker, Barney Beasley, Hank Bell, Ted Billings, Charles Brinley, Ralph Bucko, Roy Bucko, Bob Burns, Eddie Buzard, Bob Card, Horace B. Carpenter, Frank Clark, Iron Eyes Cody, Buck Connors, Tex Cooper, Ben Corbett, Ann Crockett, Al Ferguson, Tom B. Forman, Jerry Frank, Harry Harvey, Fred Humes, John Ince (Thomas Ince's brother), Cliff Lyons, Cactus Mack, George Magrill, Ken Maynard, William McCall, Frank McCarroll, Bud McClure, Ralph McCullough, Nelson McDowell, Art Mix, Monte Montague, Jack Montgomery, Buck Moulton, Charles Murphy, Bill Patton, George Plues, Rose Plumer, Jack Rockwell, Bernadette Sebastian, S.S. Simon, Hal Taliaferro, Harry Tenbrook, Chief Thunderbird, Buddy Wacker, Wally West, Slim Whitaker, B.J. Wilson and Chief Yowlachie	(archive footage). Stunt performers are Ben Corbett, Cliff Lyons, George Magrill, Frank McCarroll, Jack Montgomery, Bill Patton and Wally West.